Rodel Tapaya, Myths and Truths. installation view. Tang Contemporary Art, Beijing. November 3 - December 15, 2018. Rodel Tapaya, "The Loss of Rivets", Acrylic on Canvas, 244 x 335 cm, 2018. 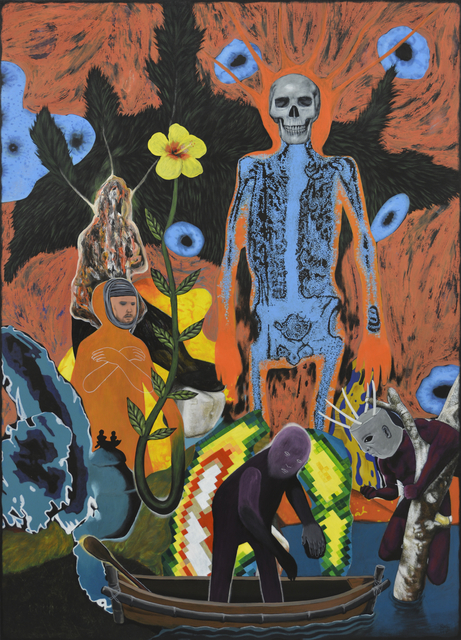 Rodel Tapaya, "Eight Headed Monster and the Tree of Life", Acrylic on Canvas, 244 x 335 cm, 2018. Solo presentation exhibited at Tang Contemporary Art Beijing. Curated by Matthias Arndt. Arndt Art Agency is pleased to announce a solo presentation of work by Rodel Tapaya at Tang Contemporary, Beijing in November 2018. Born 1980, Rodel Tapaya lives and works in Bulacan, Philippines and is considered one of the most important Filipino painters of his generation and one of the most active artists working in Southeast Asia today. In his work, he conveys important stories of his country, the people and topical local societal issues from the Philippines that intertwine traditional storytelling within a contemporary context. As all great storytellers do, he draws connections between the imagined and the real, history and the present day, and myth and current events. 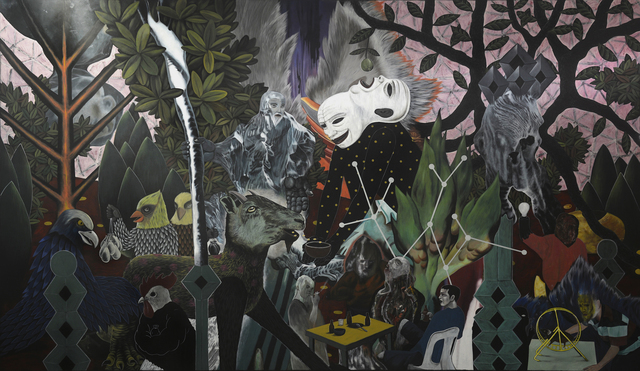 As a figurative painter, Tapaya’s intriguing literary-based compositions transcend beyond their local context to universal situations and are reminiscent in style to painters from the German Expressionist tradition such as Neo Rauch, Max Beckmann, as well as finding parallels in the painterly developments of artists such as Daniel Richter and Peter Doig, among others. 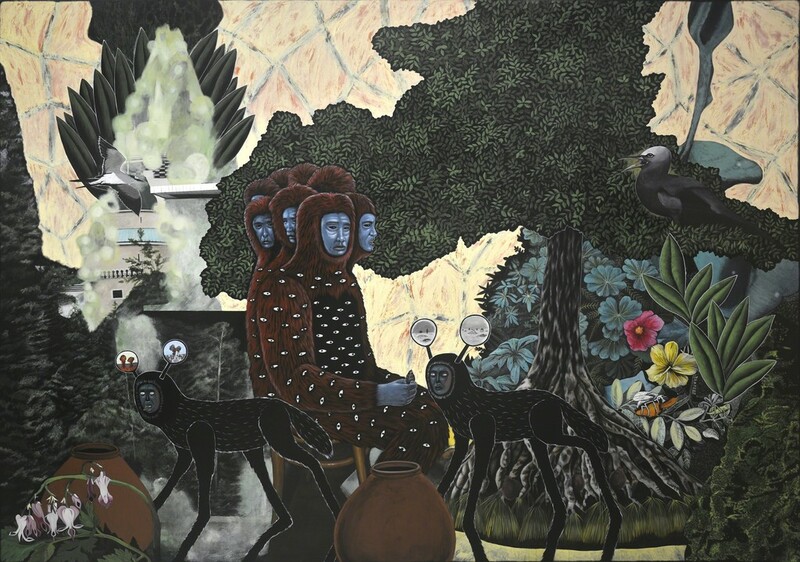 Utilising a range of media — from large acrylic on canvasses to an exploration of under-glass painting, traditional crafts, diorama, and drawing —Tapaya filters his observations of the world through folktales and pre-colonial historical research, creating whimsical montages of his characters. 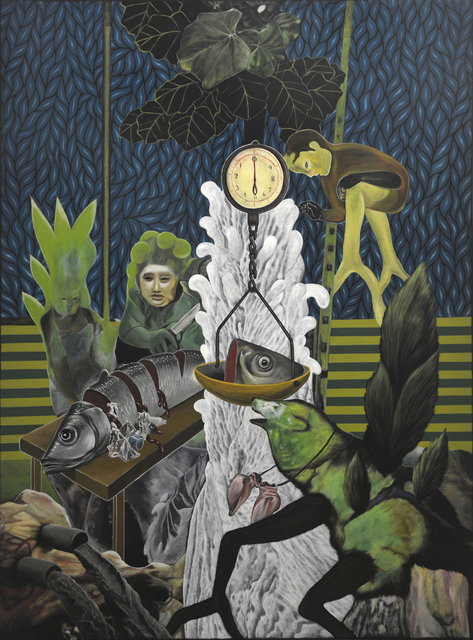 Each work has its origin in Tapaya’s reflections on a particular time or place that possesses an enduring resonance, from its correspondence with the formalistic and psychological implication of the grid in his earlier works to protracted ventures which excavate and interpret myth and folk aesthetics. For Myths and Truths the artist will present a range of monumentally scaled paintings alongside medium scale works, an installation piece and film. The artist speaks about his solo project: “A French anthropologist, Claude Levi-Strauss, founder of Structural Anthropology once said, “I therefore claim to show, not how men think in myths, but how myths operates in men’s minds without their being aware of the fact.” This exhibition is about the exploration of the dichotomy between scientific truths and the rich mythical stories from my country, The Philippines. As Levi-Strauss believed that myths are not simply a random construction of primitive beliefs or backward mentality instead myths are pseudo-histories. They provide the raw material for a systematic analysis of how humans unconscious mind works. As a young boy, I was told of a story about a giant named Bernardo Carpio who attempted to end the battle between two fighting mountains, however in the end he got buried as a prisoner inside those mountains, in the cliff in Montalban, Rizal, northern part of the Philippine to be exact. We believe that whenever there are tremors and earthquakes, people believed that Bernardo is trying to escape. I always believed this story as a fact. And it became the seed of my fascination about myths and folktales in my country. Rodel Tapaya was awarded the coveted Grand Prize in the Nokia Art Awards in 2001, which allowed him to pursue intensive drawing and painting courses at Parsons School of Design in New York and the University of Helsinki in Finland. He completed his studies at the University of the Philippines College of Fine Arts. 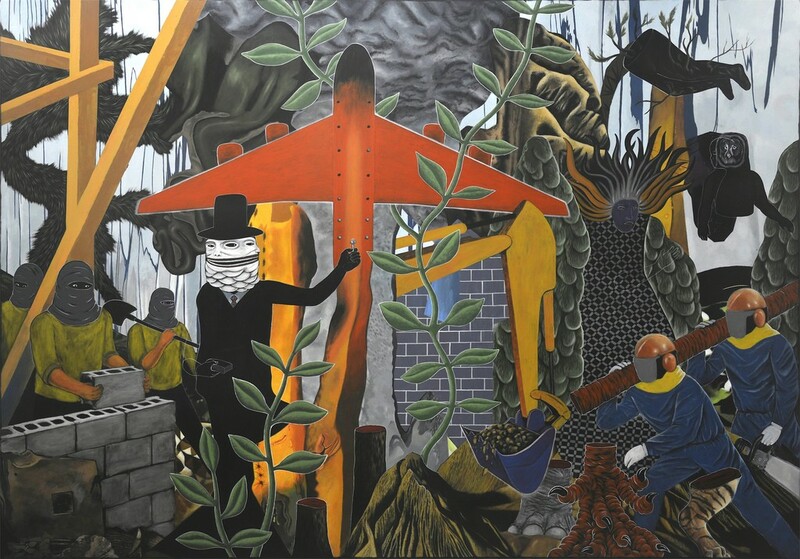 Selected solo exhibitions include: Urban Labyrinth, Ayala Museum, Manila, Philippines (2918), Rodel Tapaya. New Art from the Philippines, National Gallery of Australia, Canberra, Australia (2017), Rodel Tapaya, Galerie der Stadt Sindelfingen, Germany (2016), "ICA Off-Site: Hong Kongese" (2015), curated by Gregor Muir, Alia Al-Senussi and Abdullah AlTurki at Duddell’s Hong Kong, "Bato-Balani" at the Ateneo Art Gallery, Quezon City, Philippines (2014), "Cloudland" at the Art Hongkong, Hong Kong (2012), "Prism and Parallelism" at the BENCAB Museum, Baguio City, Philippines (2012), "Flowers of the Tongue" at the Vargas Museum, UP Campus Diliman, Quezon City, Philippines (2010) and "Mythical Roots" at the SOKA ART Center, Beijing (2009). Selected group exhibitions include: 15th Asia Arts Festival, Ningbo Museum of Art, Ningbo, China, Terra Incognita, Hilger BrotKunsthalle Vienna, Austria, Passion and procession. Art of the Philippines, Art Gallery of New South Wales, Sydney, Australia, Pinto: Manhattan Manila, West Village, NYC, USA, 20th Biennale of Sydney, Sydney, Australia (2016), "June a Painting Show, Sadie Coles HQ, London, UK (2015), Bisa: Potent Presences at the Metropolitan Museum of Manila, Philippines (2011) and Thrice Upon a Time: A Century of Story in the Art of the Philippines at the Singapore Art Museum, Singapore (2009). His work is held in the following international museum collections: Art Gallery of New South Wales, Sydney, Australia, National Gallery of Australia, Canberra, Australia, Mori Art Museum Collection, Tokyo, Japan, The Hori Science and Art Foundation, Nagoya, Japan, SAM - Singapore Art Museum, Singapore, Bencab Museum Collection, Benguet, Philippines, Ateneo Art Gallery Collection, Manila, Philippines, Pinto Art Museum, Philippines, Bangko Sentral ng Pilipinas (Central Bank of the Philippines).